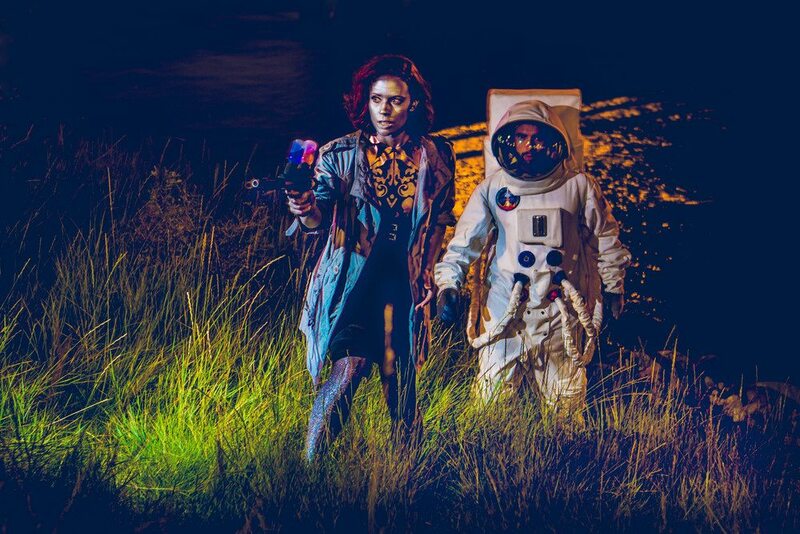 "These are the types of creative talent that make the impossible look easy..."
RocketHouse and Beakerhead are like binary stars: one always complementing the other. We share a lot of our identity. 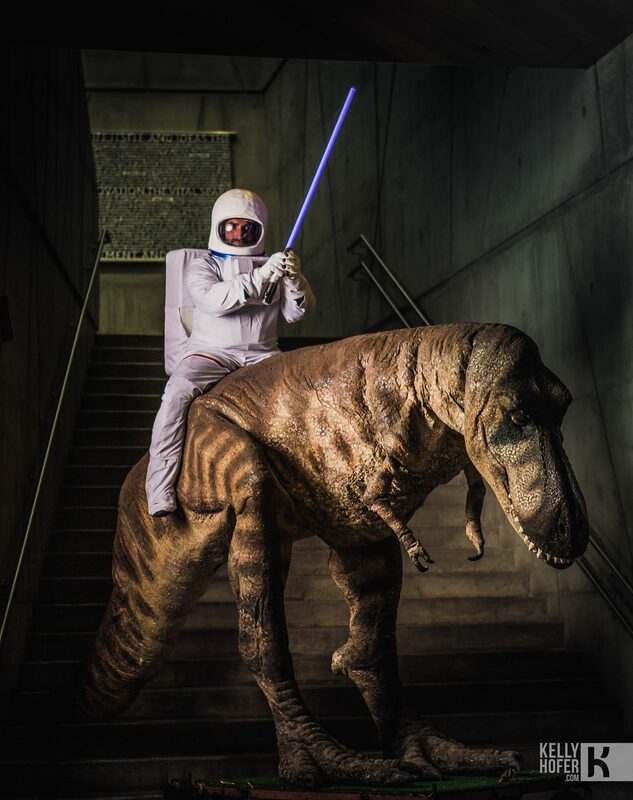 Many of our most iconic characters and images have been born of projects with Beakerhead — a pattern that makes sense when you consider our mandates are parallel: immersive experiences to spark curiosity. 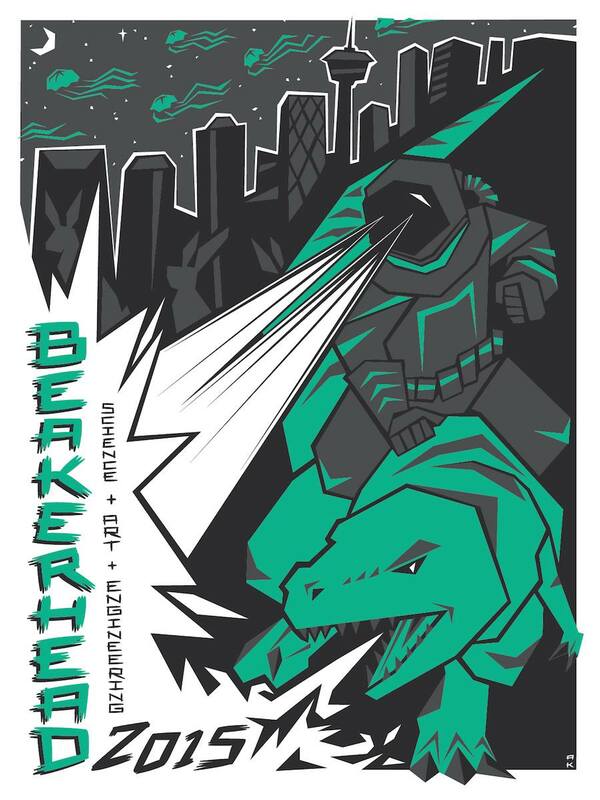 We’ve been part of Beakerhead since their inaugural opening ceremonies in 2013 (just before we minted RocketHouse) and, since, have had our custom characters — like the Astronaut, the Android, Persephone, and our Parkour Crew — plastered on screens, billboards and print ads all over the world. 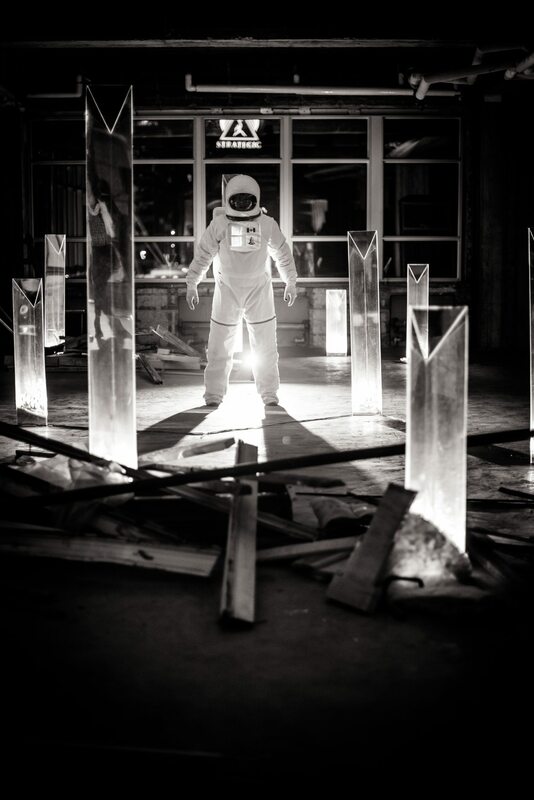 We are excited to say, you’ll likely see a lot more co-pros from the smash up of arts, science and engineering that is Beakerhead and the immersive experiences that are the cornerstone of the RocketHouse identity. Mary Anne and Jay aimed to translate the energy of what they were writing about into tactile experiences that would inspire. They chose Calgary as the hub. We might seem like a little-known city on the world stage but we’re filled with engineers, supportive companies, and a community culture that craves mind-bending experiences. 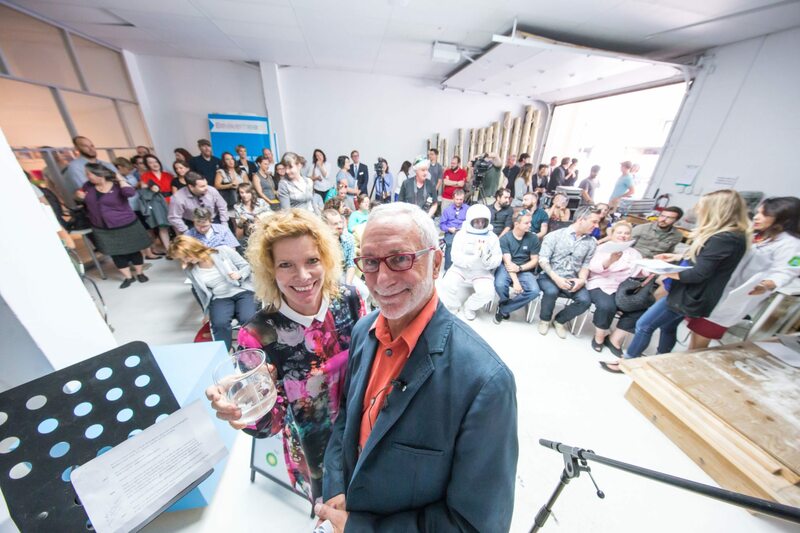 To fulfill the challenge, MA and Jay have collected a pantheon of Calgary’s most inventive and tireless makers, thespians and technologists to scour the world (and the city) for the most inventive stuff from the intersections of arts, science and engineering. The result? 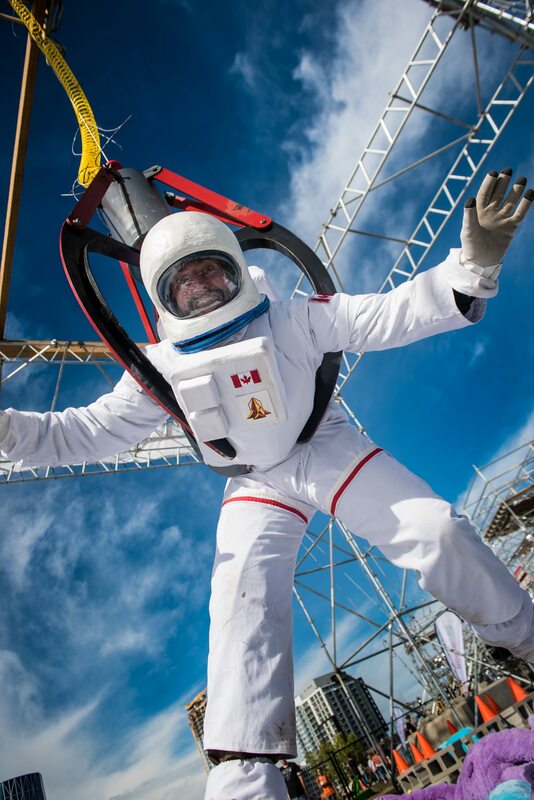 Only five years on, “Beakerhead” has become shorthand for 140-foot fire-breathing animatronic snakes, catapult competitions, sing-alongs with real astronauts, city-wide art installations and, in general, an annual line-up that stokes the creativity of an entire city. Their unofficial motto is “Wow!…then, Why?” Leading with excitement to stoke intrigue has worked. 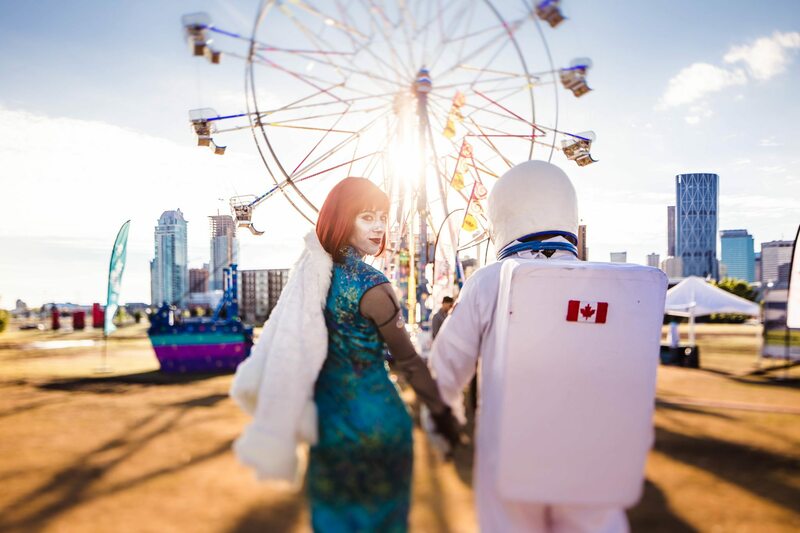 With more than 145, 000 people having attended the 2017 events, Beakerhead has become a mainstay of cultural creativity in Calgary. And while it discovers awesome installations from around the globe it is also actively fuelling local ideas. 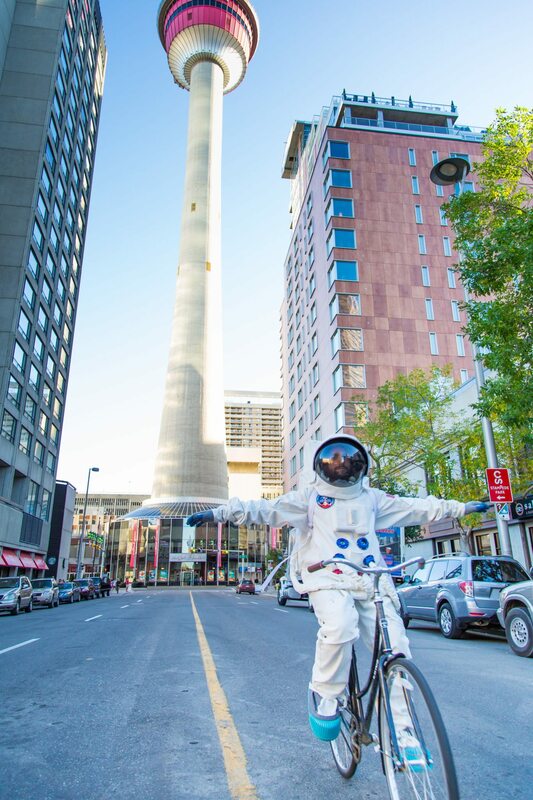 70% of the experiences of Beakerhead 2017 were Calgary-created. We’re proud to count many of RocketHouse’s projects among them. 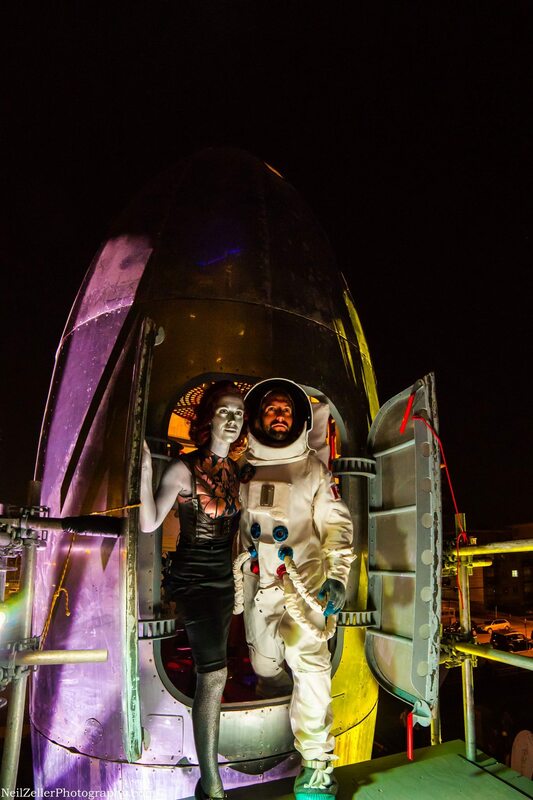 The opening ceremony for Beakerhead’s inaugural year was just coming to a close. Our Parkour performers were strenuously calming their breath while holding their final pose, pointing to the sky where a giant mechanical spider was descending from a crane. Fireworks shot off the Calgary Tower in the background, framing Mayor Nenshi and an ‘astronaut’ who overlooked the scene from a looming scaffold stage. RocketHouse was still just forming at the time. We had projects, clients, collaborators, amazing performers and a kickass company name, but we hadn’t officially launched. 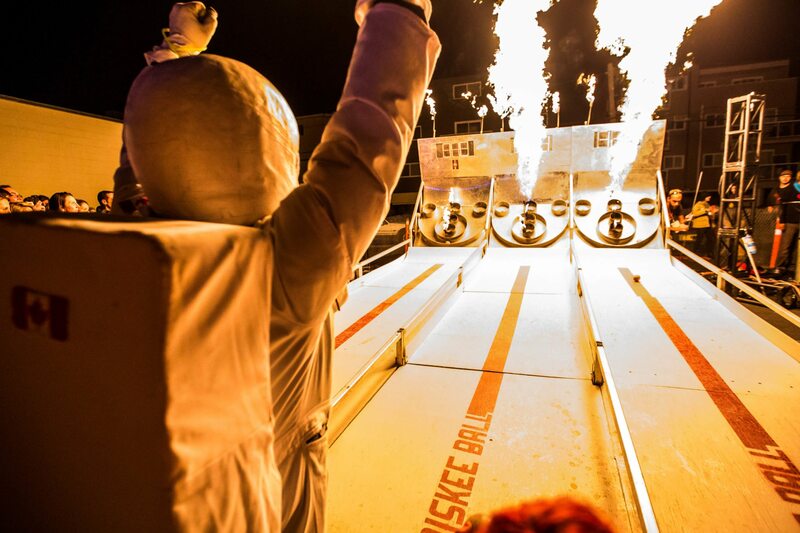 Beakerhead kicked us into overdrive. If anything, it was an aligning of the stars. 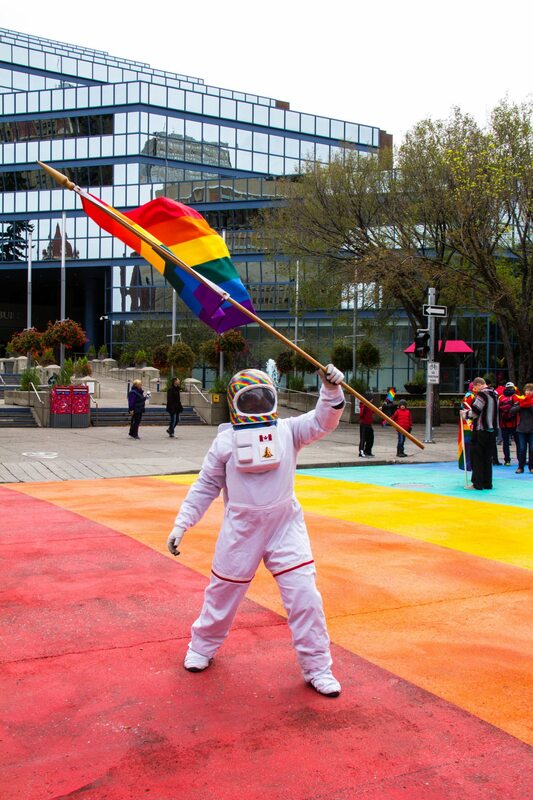 Not long after we had wrapped the ceremony, Beakerhead phoned to ask if I was keen to wear the astronaut suit. They’d flown it up from LA but only had an actor for that one performance. But the astronaut suit was going to stay in town throughout the rest of the week; why not put it to use? Obviously, we said yes. Across town, Zoë was covered in silver paint. Black, painted gears outlined her bones and accented the completeness of her silver skin. Her outfit shimmered in geometric patterns. 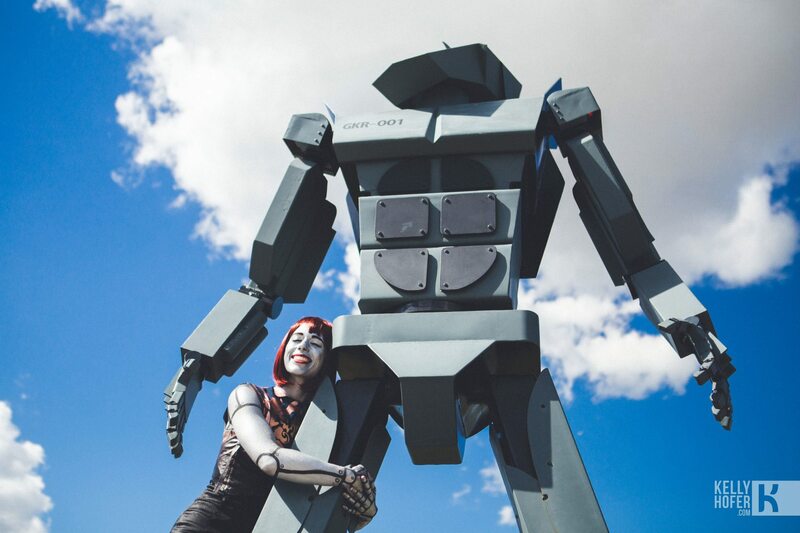 With mechanical movements, she traipsed along the sidewalks and through the halls of International Ave’s blackbox theatre where Swallow-A-Bicycle was mounting i-Robot as part of the Beakerhead line-up. 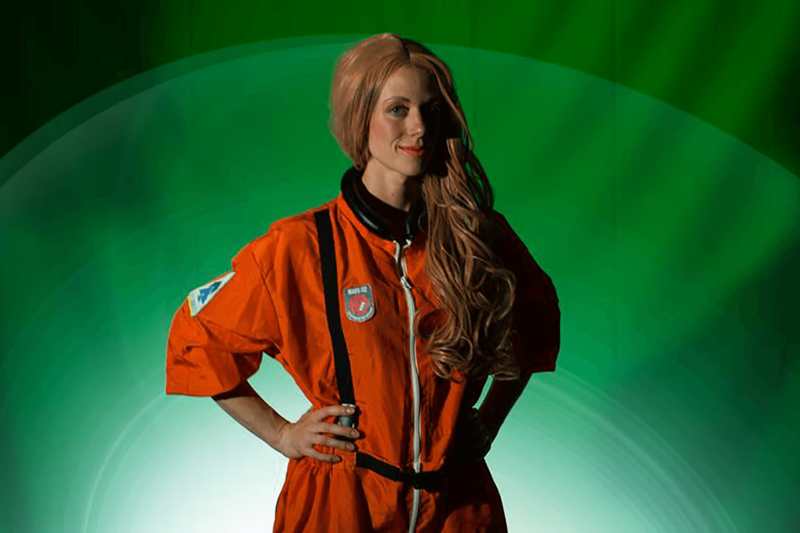 Zoë’s Android was the promotional face of the show. 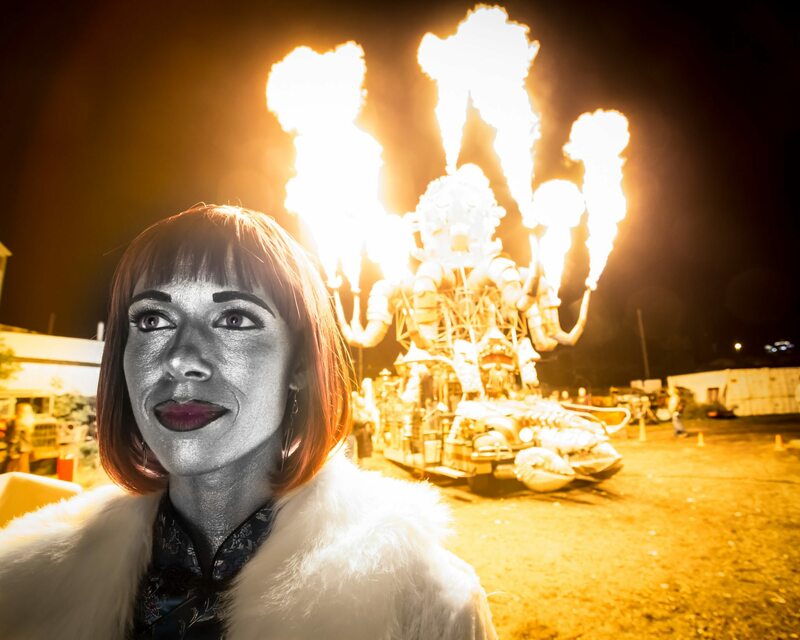 Once the matinee audiences were let in, she’d transition to Beakerhead’s Four-to-Six festival along Stephen Ave, her titanium visage joined the hubbub of art cars, rolling science exhibits and curious guests. This would be the setting for a love story that would transform two companies and transcend all space and time. 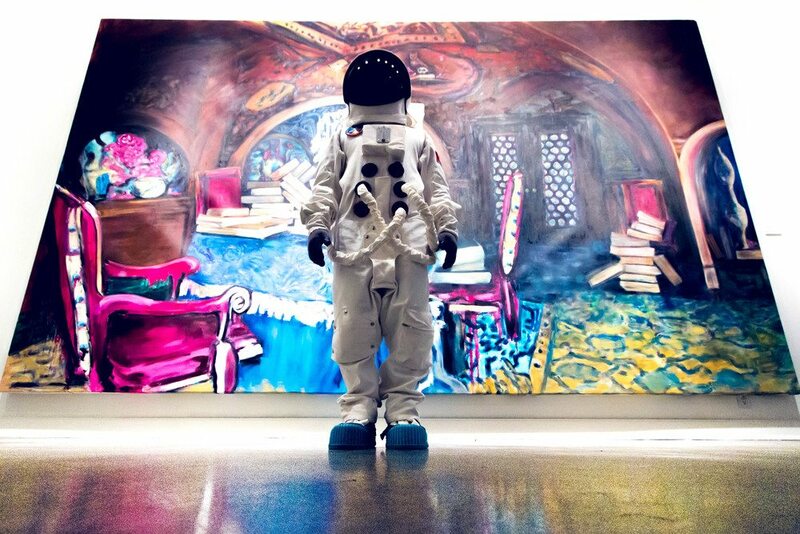 Day 2 of Beakerhead, The Astronaut materialized on the top floor of the Stephen Ave space of the Art Gallery of Calgary (now part of Contemporary Calgary). 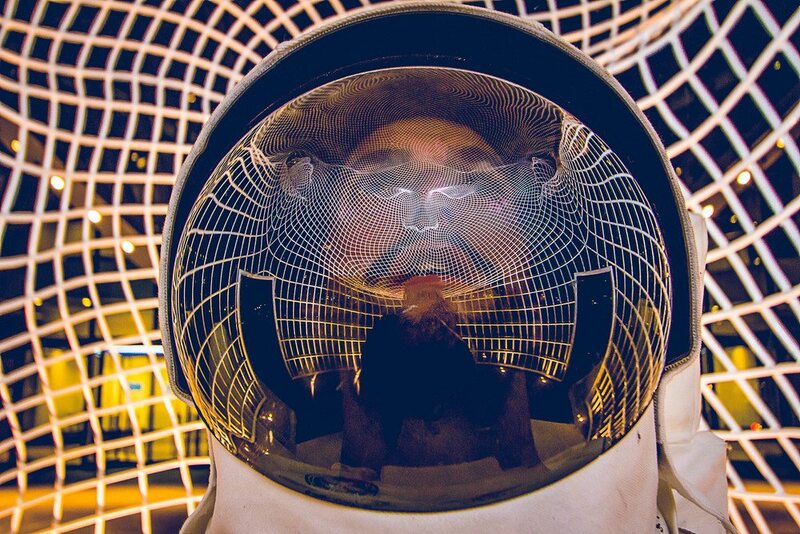 Instantly, with the suit and mask on, I knew who the character of The Astronaut needed to be: a galactic explorer filled with wide-eyed wonder moving through all space and time in weightless slow motion. Zoë walked in, flanked by our friend and visionary photographer, Kelly Hofer. We had an entire contemporary art gallery to ourselves. The exhibits became the landscape for a budding laboratory love story filled with disdain and android duplication. 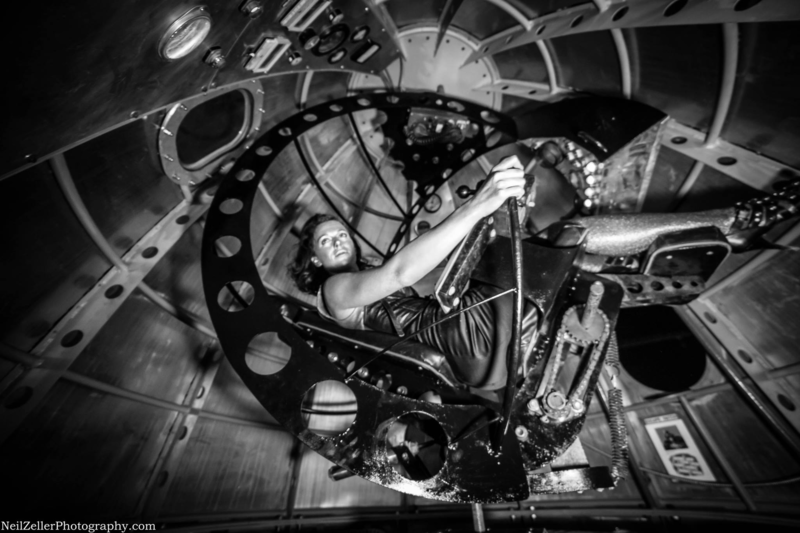 The narrative and visuals that played out in front of his lens captured the imagination of readers the world over, spreading across sites like My Modern Met and then spilling out into the live world of Beakerhead. 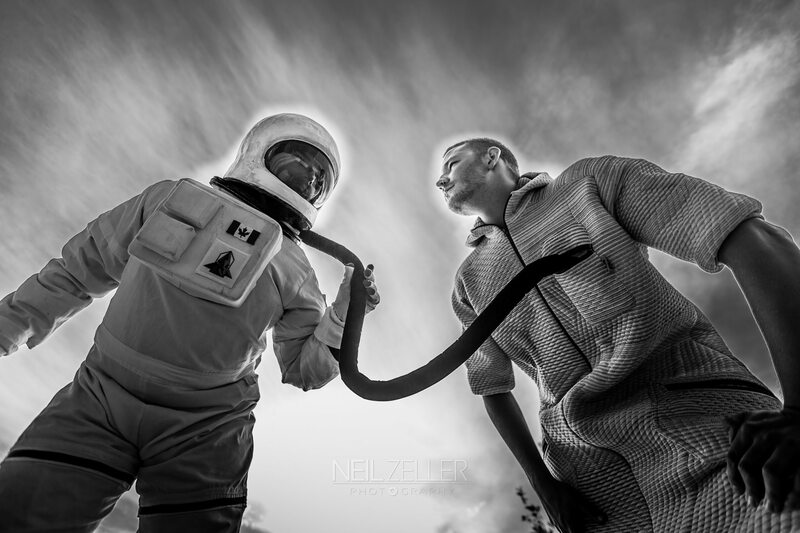 This story set the stage for years of offshoot narratives and creative exploration as the Android and Astronaut adventured through the world of Beakerhead, its art and guests. Read Kelly Hofer’s Original Story here. Above: In 2016, we amalgamated three years of photos into a ‘lost history’ social media campaign. It was a fictional recreation of conspiratorial backstories of the Android and the Astronaut. We used the campaign as both an explanation and send off of the beloved characters as we retired them from the current Beakerhead universe. 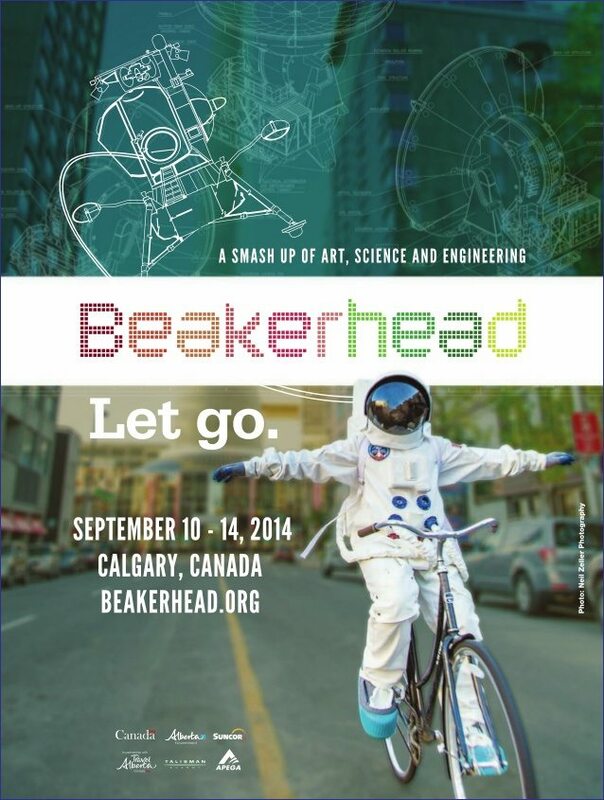 Beakerhead’s beauty is in its flexibility. It reaches its creative tentacles (sometimes literally) into every nook and cranny of Calgary, setting up activated exhibitions all over town. They pair this with roving bands of photographers and videographers who strive to capture the moments of curiosity. For us, we not only get given the mandate to experiment with our characters but we also get the support of photographers who capture the results. It is the perfect brew. 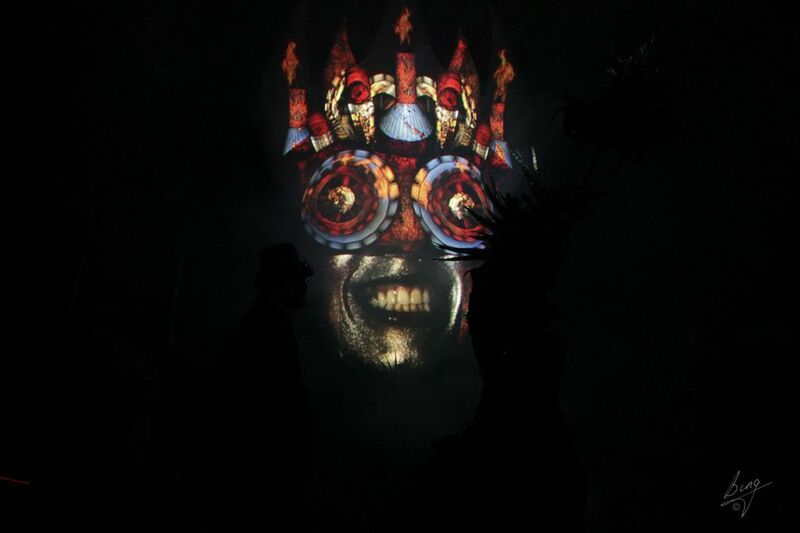 When the interactive experience is constantly being captured it means that the performance has to be alive whenever and wherever an audience is present. The result has been a myriad of iconic shots that have come out of unexpected interactions. 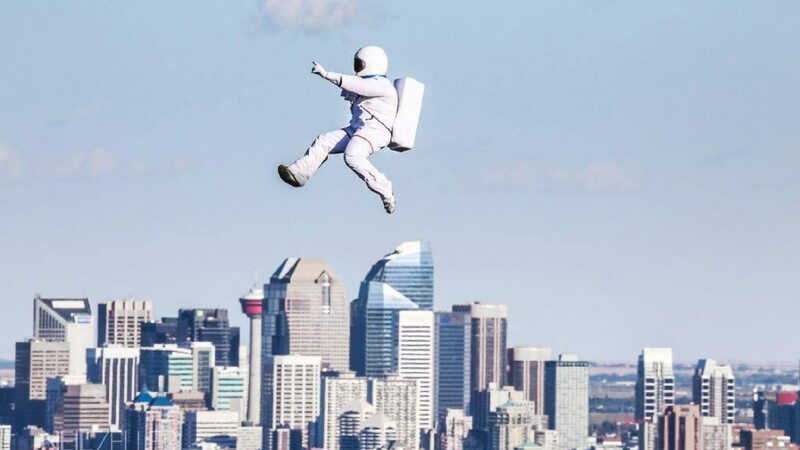 A segment on the Weather Network went viral when a snowstorm stalled the opening day of Beakerhead 2014 and effectively shutdown the city, but we were already scheduled to film with the Astronaut. Somebody captured the results on their cellphone, sending in a blurry video the equivalent of a space-aged Sasquatch strolling through the snowy streets of Calgary. 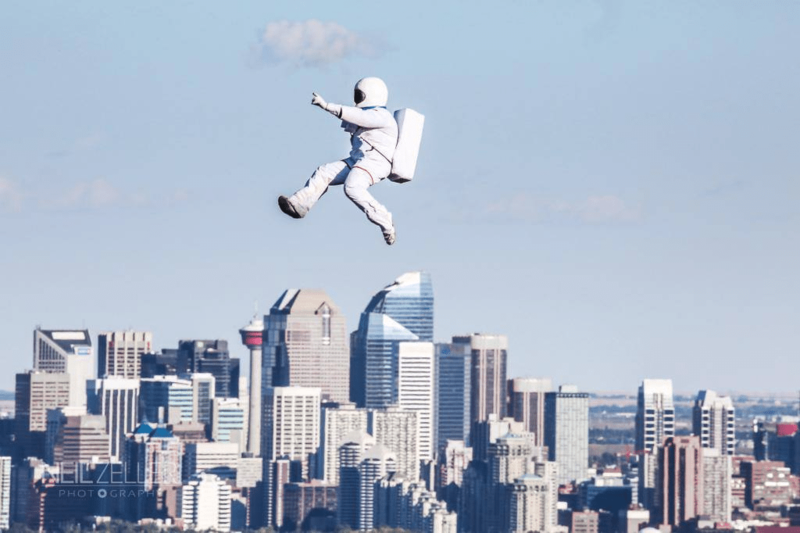 The total story with Beakerhead has been a feedback loop of trying something new, assessing the results and then pushing forward with a new attempt. It could almost say it is scientific. In year one we recognized the power of bringing audiences into a character interaction in unexpected settings. So in year two we built. 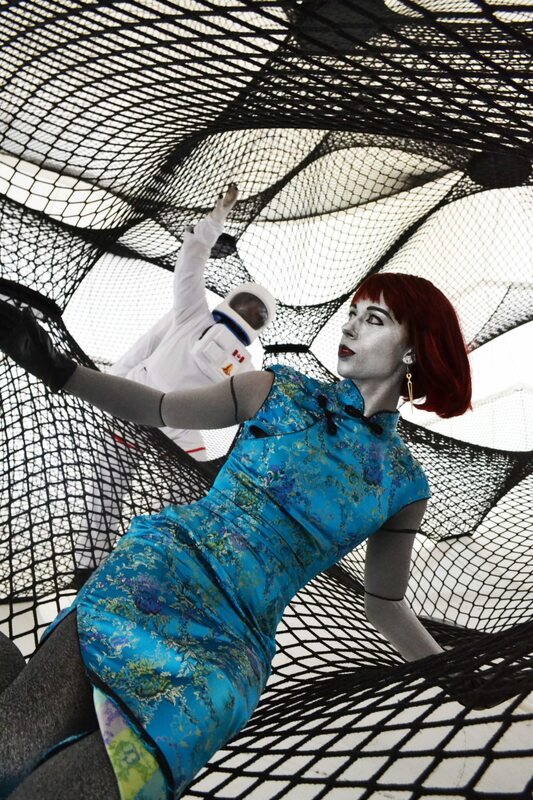 The Android was explored as a projection-mapped mechanical deity for the media launch; the Astronaut suit was rebuilt from the ground up (with the deft collaboration of Erin Bauer) with an internal harness so that we could lift him up on cranes and have him float weightless above the crowds. And our Parkour performers became firecrackers of guerrilla marketing and deployed for impromptu performances when lines formed at over-capacity installations. Each progression came with learning moments (read: “failures”). The most notable involved the Astronaut, a high-speed zipline and a parachute that didn’t deploy correctly because it got caught on the costume. Oops. Luckily, we built the helmet out of an adapted and reinforced motorcycle helmet. It literally saved my face and my spine. Now we know to adjust for such hang-ups in advance. Since retiring the original version of the Android and the Astronaut, we’ve haven’t had to stop exploring. In 2017 we collaborated with old friends, playwright and director, Gina Freeman, and videographer, Nick Taylor of Pixels + Photons, to fulfill Gina’s vision of an interactive theatre space with no actors. It was called Mars 112. Calgary writers’ room, Loft 112, was converted into the semi-inhabited failing first condo development on the surface of Mars. 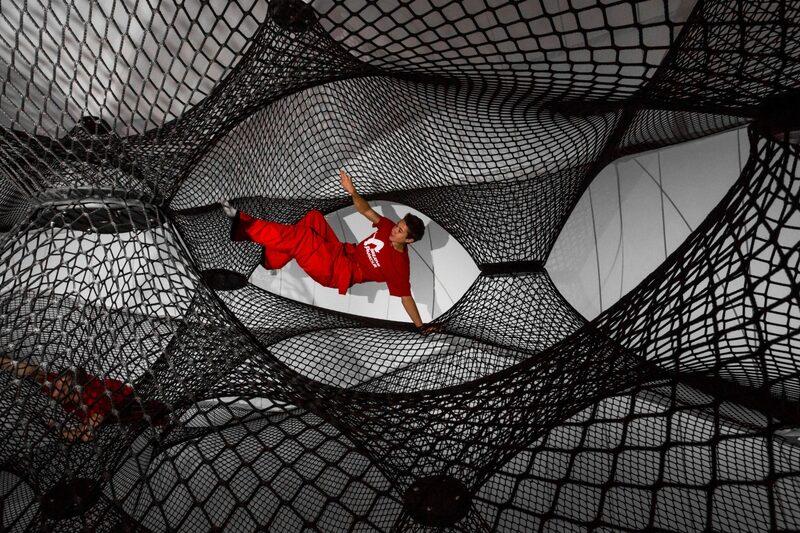 Audiences would step through a ‘decontamination chamber’ into the first (and only) showhome on Mars. The space was littered with comically cute robots, unwashed dishes, unattended lab equipment and a suspicious lack of development’s agent, Persephone (played by Zoë). Instead, in each intriguing room they would discover video logs from Persephone. Each vlog helped piece together a puzzle of a zippy and excited condo rep slowly loosing her grip on reality as she babysits a years-delayed development, alone on the surface of Earth’s neighbour planet, no support or communication from her employers and only the company of her robots and (failed) genetic experiments to make helper creatures with a CRISPR gun. The whole space became activated by films and set without a single actor on site. 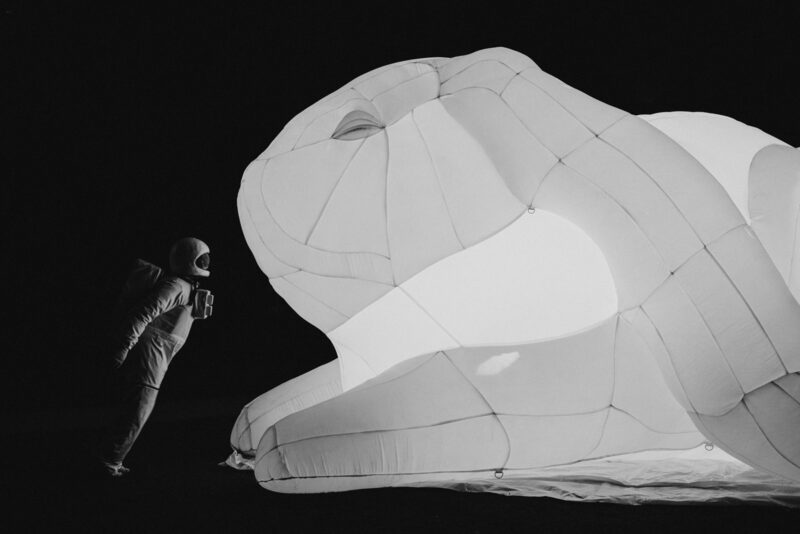 It was one of our favourite explorations of immersive entertainment yet, and certainly will not be the last, especially with Beakerhead.